Typing this up on my laptop. I am basically totally out of my depth on this one. After months of working flawlessly, Arch won't boot up anymore as of today. I have no clue what happened. When I select the AL entry in the systemd-menu, the screen basically goes black except for these blue lines at the top and bottom (which I'm somewhat sure are from the mainboard's UEFI menu itself). And... that is pretty much it. Fortunately I have a Xubuntu thumb drive which I used to check out the loader entries and UUIDs/PARTUUIDs of the partitions, maybe something went wrong somehow? Nope, everything is still as it was. So I noticed the Windows partition cannot be mounted in rw mode, it can only be mounted in ro-mode. So I did. It seems fine. Even the arch.conf entry I created a couple of months ago is fine. Started up and shut down Windows 10 for 2 times. It went fine. Checked these hibernation settings twice, hibernation is still off. Installed the lts-kernel and its headers. Typed this post on my main machine btw. Life makes sense again. Will mark this as solved as I am the OP, but this shouldnt stop anyone from posting tips/advice or questions. Thanks for the help anyone. I can chroot into the installation and update as usual via '-Syyu'. Was literally just able to chroot into the install correctly and do "bootctl update". In any way, I have to go leave the PC for a couple of hours. Checked that link real quick and I am somewhat happy to not be the only one. Can only provide photos of lsblk and blkid for now. Here are the earlyprintk=efi pics that were removed in the other thread. I will try to disable ACPI. Setting 'acpi=off' continues booting but early KMS (nouveau) doesn't kick in (low res), X-Server doesn't start and keyboard doesn't work. Something's wrong with handling BGRT table in kernel 4.11 i guess. Does "noapic" bail you out as well? If it is just that one commit the linux-git package should then produce a working kernel. Well, here's to hoping for a relatively quick fix. @jones just to confirm it is the same issue can you produce the same Oops as Maniaxx? 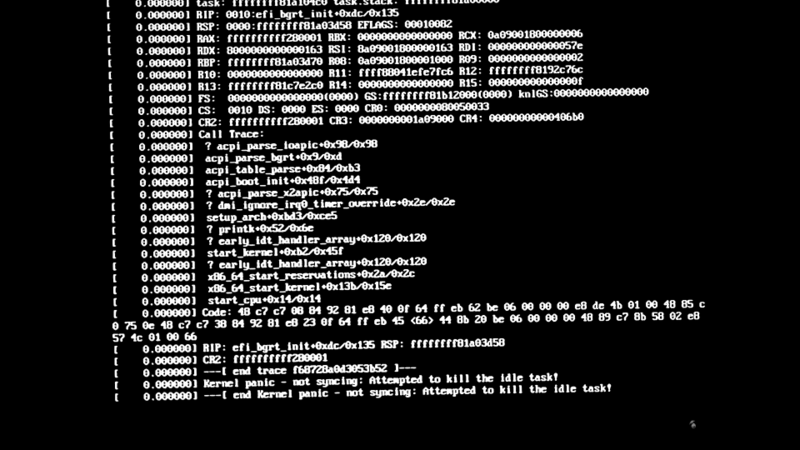 [    0.000000] Kernel panic - not syncing properly: Attempted to kill the idle task! [    0.000000] ---[ end Kernel panic - not syncing properly: Attempted to kill the idle task! Confirmed. Revoking the commit boots the kernel properly. I'm on 4.11. Thanks! Not sure if these dmesg errors are 4.11 specific. Possible that they also appeared on 4.10. And now... should I rather use the LTS Kernel? reporting-bugs not all subsystems use the kernel bug tracker the author should at least be able to point you in the correct direction. I will try latest dev kernel first and 'nomodeset' parameter. There is still progress on the BGRT code. Maybe it's already fixed but not yet backported. I'd be more inclined to tell people to stay with linux-lts until this is fixed than using acpi=off for day to day usage, at least for people with laptops. The reason is, if I'm not mistaken, you will not have cpu power management and will generate more heat and use more power. So it is working again. Can you print the bgrt table like below and save the kmesg? I would better to have a full kernel log, for the working kernel and failed kernel. Possibly try inserting the code here. Source file compiles but linking fails. Cleaned build directory v4.11.2 without the revert but with the above lines added to efi-bgrt.c now compiles and links but not tested. Cleaned build directory v4.11.2 with the revert and the above lines added to efi-bgrt.c fails to link. Line 35 is probably too early as bgrt is only initialized on line 44 but that is after the acpi check so if you run it with acpi disabled it will not reach there if you run it with acpi enabled the output will be replaced on the console by the Oops. Ideally needs a system with a serial port to dump console output to. I've been having this issue for a couple of days. Would downgrading the kernel to 4.10 (or something else) also solve this problem? Hey, be nice...I'm new at this! I need some info from affected and non-affected systems. Would be great if we could collect at least 3 of each. Post the result like below. Don't forget to mention if the system is affected (freeze on kernel 4.11+) or not. Your current kernel (when doing acpidump) doesn't matter. You can do it on LTS kernel or any other. Thanks! [00Ah 0010   6]                       Oem ID : "ALASKA"
[010h 0016   8]                 Oem Table ID : "A M I"
I have an affected desktop system. I use grub to boot in UEFI mode. On kernel 4.11 it freezes at initramfs. I don't know if this is going to matter, but I boot with some virtualization options turned on for VGA passthrough. Aloha Herr Maniaxx. Here you go! edit: My motherboard is the ASROCK H67M, btw. I have an affected desktop system (see also my other thread here: https://bbs.archlinux.org/viewtopic.php?id=226873). Currently running fine again with the -lts kernel. 0020: 13 00 01 00 01 00 00 00 01 00 00 00 18 C0 65 0A  // ..............e.
I don't use any custom kernel parameters. For the three working samples you might try the IRC channels I checked my system its ACPI does not contain a BGRT section sorry. 0020: 13 00 01 00 01 00 00 00 01 00 00 00 18 B0 62 0A  // ..............b. 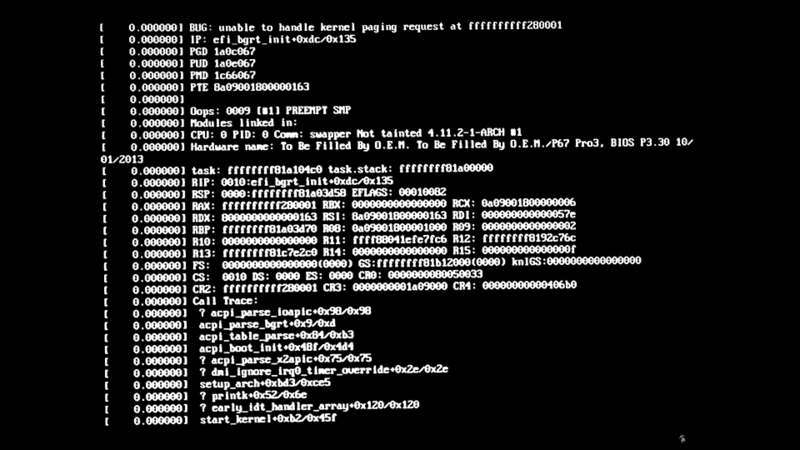 With the 4.10 kernel on my system BGRT was ignored, as memremap of the bmp image header failed. But despite this message, the system was booting fine. I have also added more information to this kernel bug report https://bugzilla.kernel.org/show_bug.cgi?id=195633.